The Beauty of Red Roses: Wishing You All the Best in 2012! Apologies that I've been MIA recently. I have clearly not posted here in quite awhile as I was living intersate these last few weeks to celebrate the Christmas and New Year's holiday with family and friends. It was great to see everyone down in Melbourne and thankfully the weather was beautiful the entire time I was there. 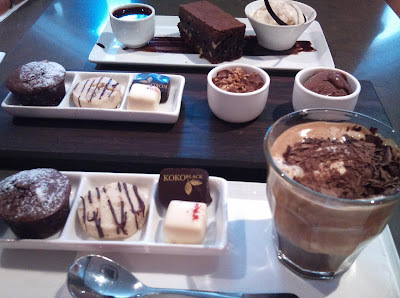 One of the many highlights during my trip were the delectable chocolate desserts at Koko Black and Max Brenners and Asian exotic ice-cream at Passion Flower in Melbourne. I hope you all had a fantastic holiday and wish you all the best in 2012! A huge thank you to all my wonderful readers for supporting my blog and welcoming me into the bloggersphere! I started The Beauty of Red Roses blog since May 2011 and I have enjoyed every bit of blogging, sharing my knowledge and thoughts on beauty products, meeting beauty bloggers in Brisbane and interacting with bloggers of similar likes! I look forward to continuing my journey on The Beauty of Red Roses blog! Those desserts look amazing, Looking forward to reading your future posts! If only Koko Black opened in Brisbane too!